The mysteries and numerous capabilities of sound have intrigued mankind for millenniums. Einstein thought nothing was faster than the speed of light. But in 2007 a team of US physicists discovered that “superluminal acoustic sound waves” can actually out-perform light in speed and velocity under certain conditions. With that finding, the potential for sound-based technology became even more apparent. 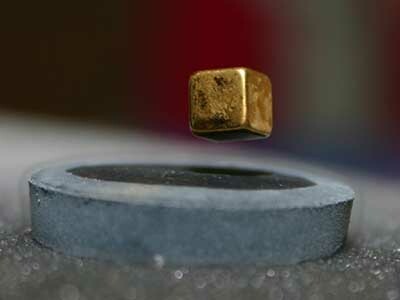 In 2014 a Japanese team of scientists from the University of Tokyo used sound to levitate objects as big as a small screw in mid-air, moving them not just up and down but also to-and-fro and side-to-side. They used an array of four audio speakers, generating inaudible high frequencies sound waves that intersect inside a confined space. The crossover of these intersecting waves creates “standing” waves. Some standing waves are kept in constant position, serving as a suspending force, while other waves are used to support a floating object within the standing waves (see VIDEO below). Unfortunately, science has still not been able to figure out how to levitate larger heavier objects. Yet, history suggests the Ancient Egyptians might have already cracked this secret in their building of the pyramids and other megalithic monuments. Did they have some advanced form of sound levitation to move thousand ton stones—a task that present day builders admit would be difficult even with the use of modern cranes? I found an interesting account of sound levitation in the book The Lost Technique by Swedish civil engineer, Henry Kjellson. Kjellson recounts the experience his friend, a Dr. Jarl, had while staying at a Tibetan monastery in the 1930’s. “In the middle of the meadow, about 250 meters from the cliff, was a polished slab of rock with a bowl like cavity in the center. The bowl had a diameter of one meter and a depth of 15 centimeters. A block of stone was maneuvered into this cavity by Yak oxen. The block was one meter wide and one and one half meters long. Then 19 musical instruments were set in an arc of 90 degrees at a distance of 63 meters from the stone slab. The radius of 63 meters was measured out accurately. The musical instruments consisted of 13 drums and 6 trumpets (Ragdons). Eight drums had a cross-section of one meter, and a length of one and one half meters. Four drums were medium size with a cross-section of 0.7 meter and a length of one meter. The only small drum had a cross-section of 0.2 meters and a length of 0.3 meters. All the trumpets were the same size. They had a length of 3.12 meters and an opening of 0.3 meters. The big drums and all the trumpets were fixed on mounts which could be adjusted with staffs in the direction of the slab of stone. The big drums were made of 1mm thick sheet iron, and had a weight of 150kg. They were built in five sections. All the drums were open at one end, while the other end had a bottom of metal, on which the monks beat with big leather clubs. Behind each instrument was a row of monks. 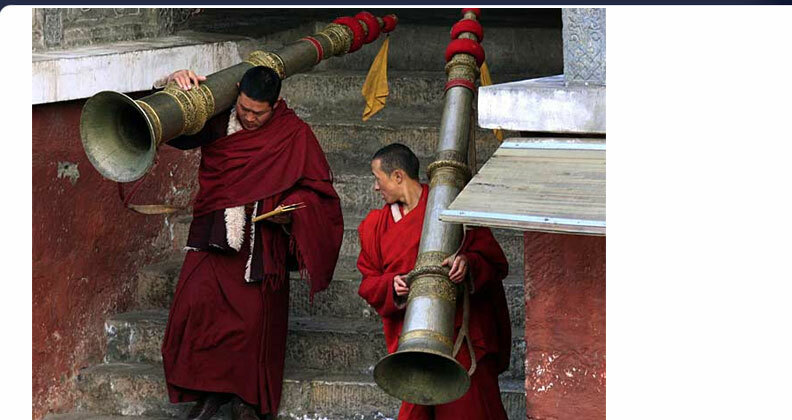 When the stone was in position the monk behind the small drum gave a signal to start the concert. The small drum had a very sharp sound, and could be heard even with the other instruments making a terrible din. All the monks were singing and chanting a prayer, slowly increasing the tempo of this unbelievable noise. During the first four minutes nothing happened, then as the speed of the drumming, and the noise, increased, the big stone block started to rock and sway, and suddenly it took off into the air with an increasing speed in the direction of the platform in front of the cave hole 250 meters high. After three minutes of ascent it landed on the platform. This account is quite incredible. It reminds me of the biblical stories of “trumpets” bringing down the walls of Jericho. Nikola Tesla also talked about experiments he made with acoustic sound waves which started an earthquake in the building of his New York City laboratory. He recounted how the beams in the building started to shake as if their molecular structure was being affected. No doubt about it—sound is very powerful. But, does it have the ability to neutralize gravity? 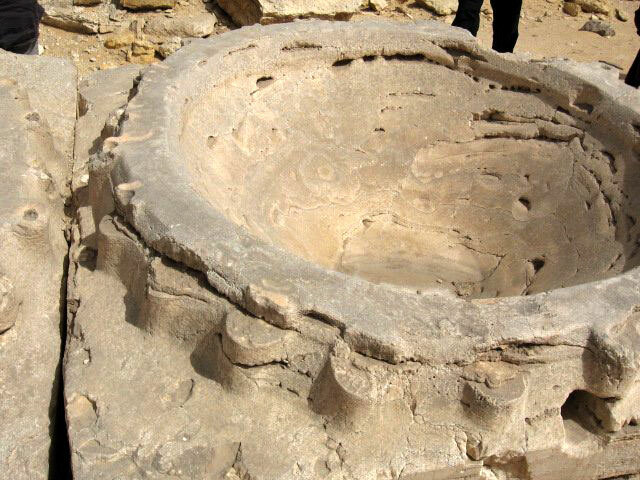 What caught my attention in the Tibetan account, was the mention of using a large size stone bowl (underlined). 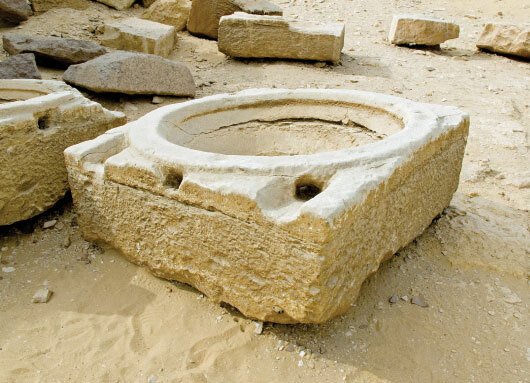 Similar stone basins (actually quartz) have been found scattered around the pyramids of Egypt and I remembering seeing one on my last trip there in December 2014. While their purpose remains a mystery to modern-day Egyptologists, the theory is that they were used for blood collection during ritual sacrifices. This is a weak hypothesis since no trace residues of blood have been found on any of the stone basins. This explanation is further discounted by the fact that each basin has three holes that are located near the upper rim of the basin, not at the bottom. These holes were not designed to let out blood from animals placed in the huge basins. If so there would be an obvious drain hole at the bottom. So what or how were these curious quartz basins used? The clue is that they were made of quartz, which creates piezoelectric charge—especially when under pressure or sound is applied. 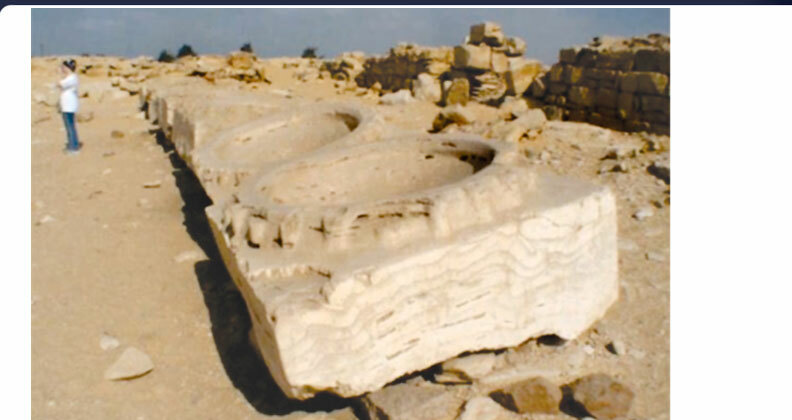 “The huge quartz basins have a borehole centered on each of the four sides of the square bases of the instruments, while the comparable limestone examples display three machine-drilled holes on just one side of the square blocks. The diameters of the bowls appear to be uniform, suggesting they were part of a large array that once surrounded the pyramids before being collected in groups by Egyptian authorities for present-day public display. The identical dimensions and curvature of the many stone basins, with perfectly rendered geometric forms, gives the appearance of having been serially manufactured through mold-making processes rather than being quarried and carved in a solid state. Abundant evidence of this fact has been ignored for close to 30 years by much of the academic community, despite publication in scientific journals. The geopolymer research of Dr. Jacob Davidovits documents the lower density of the limestone blocks of the Great Pyramid, showing them to have been synthetically cast using a concrete-like slurry composed quite differently than all naturally sedimented limestone. The pyramid’s massive limestone blocks contain an exotic admixture of opal CT, hydroxy-apatite and silico-aluminates that enhance the limestone’s natural capacity to convert all atmospheric acoustic energy into an electrical current within the crystals, inducing a strong electromagnetic field around the pyramid structures and within their passages and chambers. The modular nature of the blocks suggests they were distributed around the pyramids as part of the original walled enclosure that once surrounded each of the three pyramids on the Giza plateau. A similar mystery surrounds the building of the infamous coral castle in Florida in the U.S. 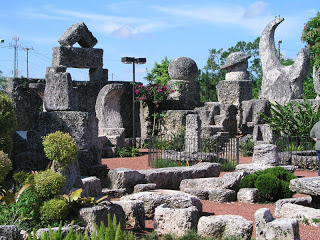 The coral castle is a stone structure that was built by one man without any help. The Latvian American, Edward Leedskalnin, said that he had discovered the techniques that Egyptians used to build the pyramids—techniques related to levitation and anti-gravity technologies. 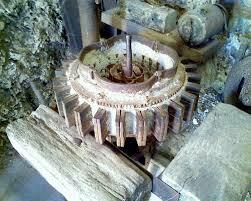 He also used a bowl-like device (see picture) with magnetic spokes. He never revealed what the round device was, nor his building secrets. It took him 28 years to build the castle from about 1923 to 1951 and he refused to allow anyone to view him while he worked. He built the castle completely on his own carving more than 1,000 tons of rock. He was known to work at night, yet neighbors reported they never heard any construction noise. If he used sonic levitation methods, the sound waves used were inaudible to humans. Arab historian, Abul Hasan Ali Al-Masudi, has written about Ancient Egyptians using a metal rod to strike stone, causing stone to levitate. The stones would move along a fenced path that was lined with metal poles on both sides of the path. The metal poles created vibrating frequencies in such a way that they would provide a moving runway for the stones. I have no idea how Al-Masudi arrived at this conclusion, or whether it is true or not, but the use of the “metal rod” is interesting. The Ancient Egyptian hieroglyphics often display a metal rod called a Was Scepter. Only the gods, pharaohs, and priests were allowed to carry such a sacred instrument. It symbolized “power and dominion.” The bottom looks suspiciously like a tuning fork which might have had some magnetic properties. The head of the scepter resembles a pteranodon, the largest “flying” reptile that ever existed. Was it in honor of the flying gods who could easily carry aloft large objects? This would explain why only the powerful few could carry it. It might have been used to strike up an earth resonance which somehow defied gravitational forces. The whole science of gravity and anti-gravity has yet to be fully understood. And I’m sure the Ancients kept this knowledge in guarded hands. Time unlocks all mysteries. I think we are getting closer to re-discovering the answers to this lost science. Just imagine the possibilities when we, too, can briefly release large stones from the confines of gravity. Yep—we could literally move mountains. I have become extremely interested in sound and levitation. I would like very much to learn more. This is magnificently exciting! I just want to know how things work; always have…and now especially sound levitation. I can understand the tremendous things humanity could benefit from these concepts, if we could just “unselfishly” share such physics. If we think about this it becomes obvious that acoustic levitation technology will ultimately lead to free energy, eliminating the need for most forms of energy, especially gasoline. It is my fear that this technology is already known and tightly held by, most likely, the petroleum industry, who would go to any lengths to protect their interests. Imagine what they stand to lose if the need for gasoline were to cease completely. I am certain that this technology will eventually come to light, but we must tread carefully.